In the Spring of 2006, almost 6 years ago, we designed an operating 12K5 oscillator that was crytal controlled and had output on 40 meters. It was submitted and written up in the May 2006 issue of CQ Magazine. It was inspired by ealier articles that introduced new hams to the old breadboard transmitters that used electricity directly from the household mains without any isolation transformer. Open wires and bare connections were used all over the board. 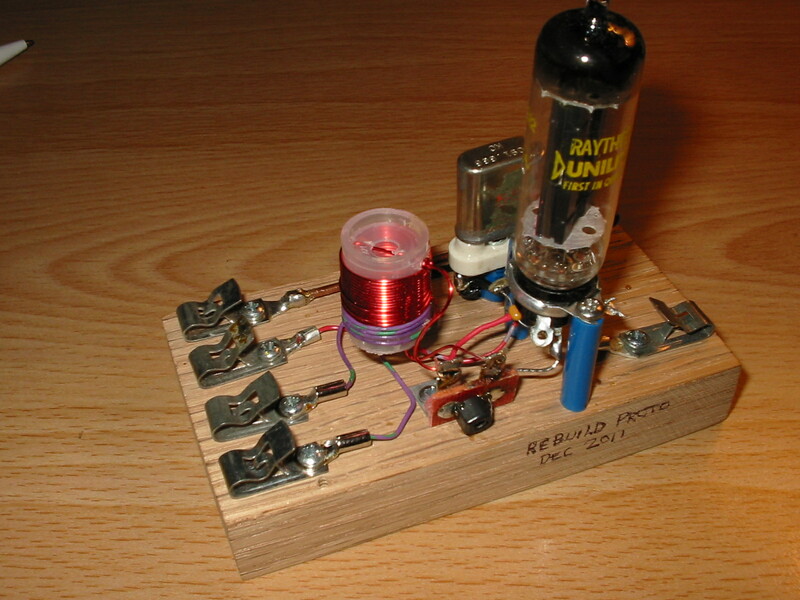 Our little transmitter used a “space charge” vacuum tube which was designed for automobile radios in the early 1960’s, before transistors were production ready. This 12K5 tube used 12 volts on the filaments and on the plate circuit. Works great except the power output is very low. Remember, volts times amps equals watts, and, with such low voltage you just arent going to get a lot of power out. Power, whether at audio or radio frequencies, is under one watt. We also sell our vacuum tube audio amplifier with a 12K5 output tube, and , yes, the volume is just fine for a quiet room or headphones, but not much more. We quit selling the little 12k5 transmitter kit when crystals became scarce. You see, we like to include the 40 meter QRP crystal in each kit. Well, for now, we are able to do it again. Please check eBay or www.pastimeprojects.com for purchase of these kits. The kit includes a wound coil assembly with link coupling, a small trimmer capacitor pre soldered on the terminal strip, a nice solid oak block finished by our Amish neighbors, and tested 12K5 vacuum tube, a great manual for step by step easy assembly, and clips, capacitors, sockets, resistors, wire and hardware to make this a fun project. You wont send CW very far on 40 meters, but distant DX communications was not the intent of this fun, learning kit. Please consider purchasing this little piece of history. Makes a great conversation piece for your shack. By the way, power can be supplied from your 12 vold dc power supply rated at one amp or more. You are currently browsing the R3tr0rad's Blog blog archives for January, 2012.